Beat half and half and egg yolks, slowly whisking in the flour, then add melted butter, salt, sugar and vanilla. Beat egg whites in a separate bowl until they form soft peaks. Fold whites gently into the batter – don’t overmix and flatten the egg whites. Grease an ovenproof pan and heat at medium high heat. Pour batter into pan, reducing heat immediately. Cook pancake for about five minutes, until batter firms up. 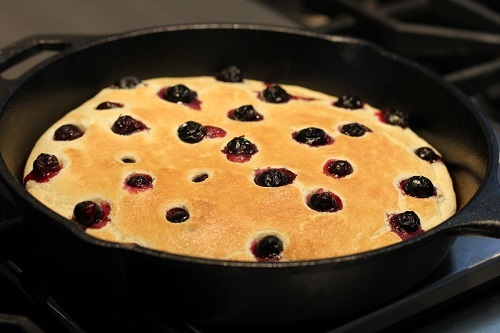 Put fresh fruit on the top of the pancake. Place the pan with the pancake under the broiler for no more than two or three minutes, until pancake puffs up and center is set.